Yahoo! Web Analytics is a highly customizable, enterprise-level website analytics system designed to help website businesses increase sales and visitor satisfaction, reduce marketing costs and gain new insight on online customers. By storing data in raw, non-aggregated form, Yahoo! 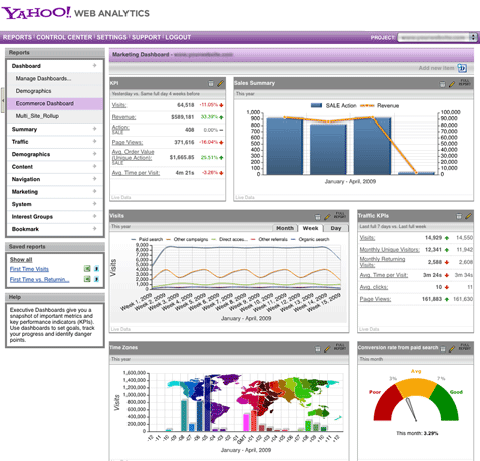 Web Analytics is more than simply a reporting tool. It is a powerful, and highly flexible, data analysis tool. Both near real-time AND historical data can be segmented instantly and even visualized with advanced graphs to help marketers and site designers answer specific business questions and find new insights to improve their business.